Sample shown in Ocean Ink. Sample shown in Fuchsia Ink. 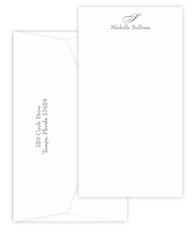 A set of flat note cards printed cards in your choice of raised-ink color with blank envelopes. Size is 6.2" x 4.5". Printed return address and envelope linings available. Your choice of triple thick stock color. Uppercase initial in lettering as shown. Your choice of typestyle for personalization under initial. Positioning only as shown.